Mori"- Little Kyoto" SUBPAGE | All Japan Kyoto Association"
Surrounded by low mountains in three directions with the Ota River running through the center of town, Enshu Mori is blessed with a natural environment. In bygone years, the town was a major lodging stop along the way to the Akiha Shrine which enshrines the deity of fire protection. From the mid-Edo period (17-19th century), it thrived as a center of vintage clothing and was named in the paintings of Katsushika Hokusai’s “A List of Thriving Cities.” When the geographer Shigetaka Shiga visited here in July 1923, he described the city as “a Little Kyoto” with beautiful nature and pure water; since then, the town has been called a Little Kyoto in Enshu. The mountain range of Mori Town is connected to the southern part of the Akaishi Mountain Range. The upper stream of the Ota River is a good habitat for Kingfisher and Amago (red spotted trout). There are many shrines and temples which have been worshipped by local people over a long period of time and the town has developed a number of unique traditional dances and festivals. In the 21st century, we are constantly asked to consider what is the true sense of “richness.” The old buildings and cultures in Mori Town will help you to find the answer. Tourists who visit Mori Town will touch the warmness of local people and experience local culture rather than just quickly passing on by car. This is a place that always welcome people with warm hospitality. 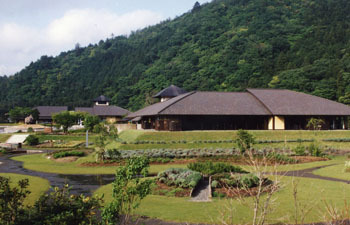 Acty Mori offers various kinds of experiences and sports including making traditional crafts, tennis and putting golf. 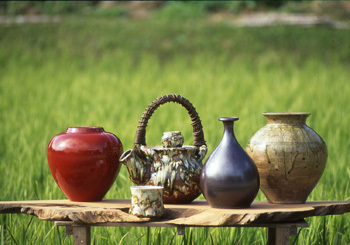 At the hands-on experience center, visitors can experience pottery making, Japanese traditional washi paper making, Japanese tile making and plant dyeing. For outdoor lovers, putting golf and tennis are recommended and from April to October, a canoeing experience is available. Please stop by at the Forest Restaurant or Hakkaku-an in the premises where dishes using fresh ingredients from Mori are used. Handmade dishes by the local women’s “AJISAI Group” are also popular here. At YONNA market, many kinds of souvenirs and local products can be purchased. 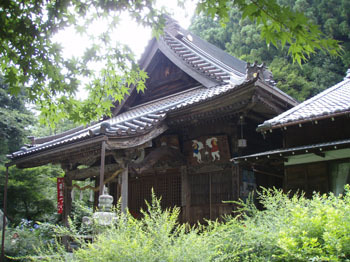 This is an old Soto Sect temple which has over 3400 sub-temples all over Japan. In front of the main gate, there is a grave of Mori Ishimatsu, a legendary hero from the end of the Edo period (17-19th century). The founder of this temple, Jochu Zenshi, left some legends including “Eternal Lantern Light,” “Pestle of Heir” and “Sand of Boundary.” Thus, the temple is often known as the “Temple of Legends.” During the autumn foliage season, a beautiful light up will be held. This temple is famous as one of the three major “Kikyo” bellflower temples in Japan. The temple was said to have been built by the 8th-generation head monk, Zenchu Wajo in 1545 who came from Soshin-ji Temple located in Iida of Mori Town. 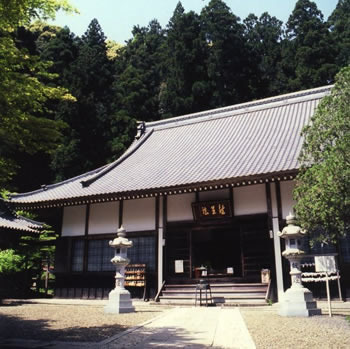 The temple is well known as the family temple of Gyobu Muto, a warrior from the Sengoku period (15-16th century). People planted about 40,000 bellflowers as they received a message from Kannon statue in the precinct. The best time to see these bellflowers are from mid-June to mid-July and from early to mid-September. Renge-ji Temple was the sole temple for study in the Totoumi area and is said to have been established by the Monk Gyoki in 704. In its peak time, there were 36 sub-temples where monks lived in the precinct. 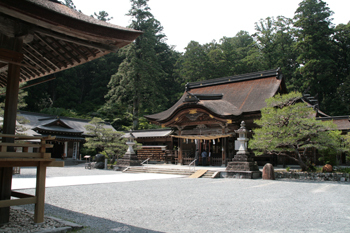 There are many temple-related names in the town which came from this time such as Daimon, Jishichiya and Ryumagatake. A story tells that when Koen Ajari Shonin went into the Sakuraga-ike Pond for the purpose of awakening, one of his prominent disciples, Honen Shonin, visited the Renge-gi Temple to commemorate his death. At the time, Honen Shonin was welcomed with countless Japanese bush clovers flowers (hagi) and he said, “This is the temple of bush clover.” There are about 15 kinds of Hagi bush clovers and they bloom one after another from Mid-April to early October. 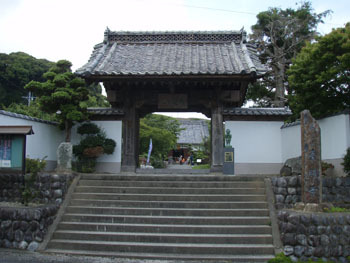 Daito-in Temple, located on the town’s outskirts, contains the grave of Ishimatsu, the man with a chivalrous spirit. The local tourist association holds a memorial ceremony for Ishimatsu every year. 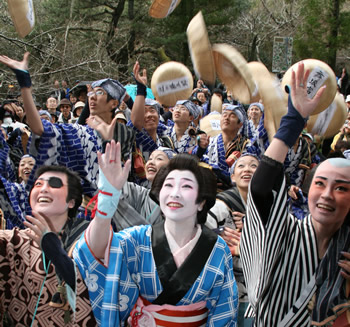 A costume parade called the Ishimatsu Festival is held once every three years. 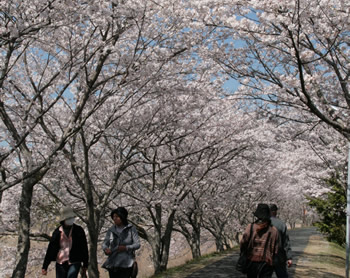 Along the bank of the Ota River, some 1000 Somei Yoshino trees will make a gorgeous blossom tunnel for 2 km. At the cherry blossom peak time, paper lanterns will be lit along the bank, creating a stunning scene. 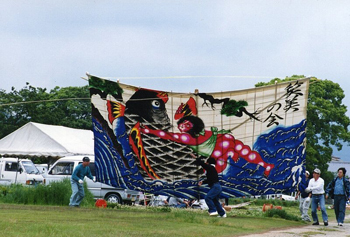 “Buka Tako” is a kite with a long square width and no tail, with two strings to hold for flying the kite. Many kinds of kites made by local people and their friends will fly in the sky over Ota River to the sounds of beating drums to celebrate Boy’s Day. 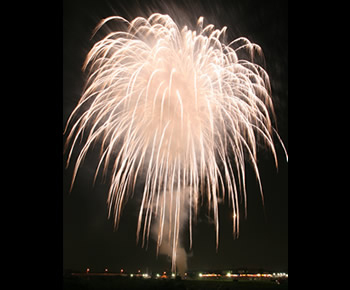 This is a local fireworks festival held with the hope that the people returning to their hometown to visit their ancestor’s graves can enjoy being with their family. The festival has been held for almost 50 years. People can enjoy some 2,000 beautiful fireworks while lying on the ground, in a relaxing mood, along the river banks of Ota River. During the festival, 14 gorgeously decorated floats with carvings from each local town will be drawn around the town through the narrow winding streets. At night, a couple of the floats are dynamically crashed into each other. The festival begins with Togyo on the festival’s 2nd day, and proceeds to Kangyo on the third day, then it will reach the climax with Maiko Gaeshi on the final night of the 3rd day. 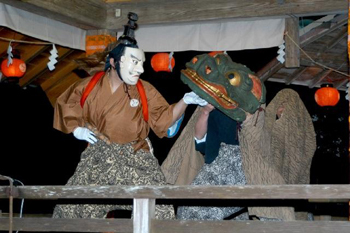 This festival is also called “Fight Festival of Mori,” due to its dynamic and exciting scenes. 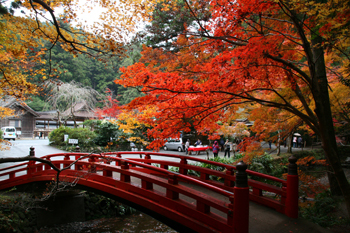 Along the path of the Miyagawa River running in the precinct of Okuni Shrine, people can enjoy some 1,000 trees decked in their autumn foliage. In the precinct of Daito-in Temple, many maple trees are planted. 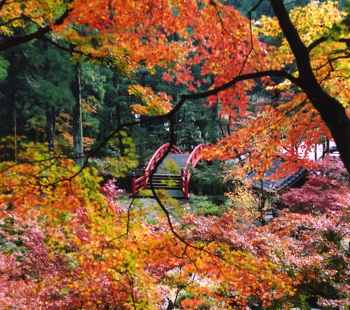 Observed from the main hall situated on the hill, visitors can enjoy a three-dimensional scene of spectacular autumn beauty. This is the Mori industrial festival. Along with Mori, nearby towns and Mori’s friendship town in Hokkaido will sell their local products. 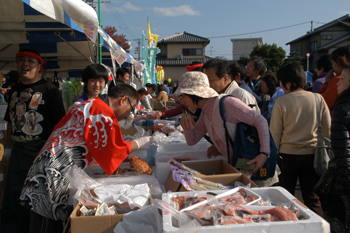 Many people gather and enjoy the festival every year. On the special stage, Tokiwa Taiko drum of Mori and other performances are scheduled to be held. 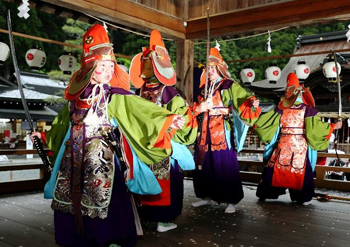 The Junidan Bugaku Traditional Dance is dedicated to the deity of Amenomiya Shrine in the Annual Grand Festival. 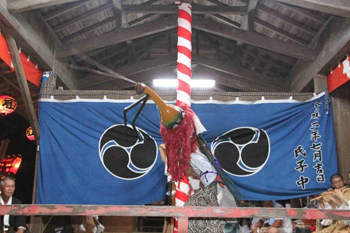 The dance is said to have been introduced in the same time as the dance of this kind inherited at Okuni Shrine. Both shrines have inherited and preserved the same music programs, old masks and costumes. The Gojomoku list made in 1590 states the rules for young people. All the festivals have been operated by Tenshakoku, the local youth group, in accordance with the rules written in the Gojomoku. The festival is designated as an Important Intangible Cultural Property. 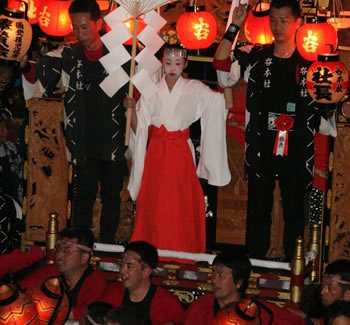 The Bugaku Traditional dance and music which is dedicated to the Okuni Shrine Grand Festival is said to have been transferred from the ancient capital in the period of Emperor Monmu (697-707). The Bugaku consists of twelve pieces including Shikiko, Taihei-raku, Nassori and others. 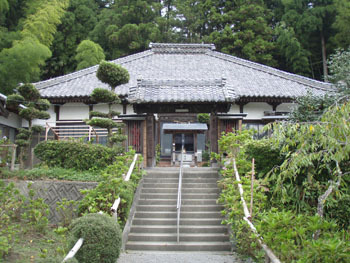 Okuni Shrine is the Ichinomiya, or the most important shrine hall of Totoumi. Thus, the shrine has been holding a traditional dance since ancient times to pray for the peace of the surrounding area and nation. The festival is designated as an Important Intangible Cultural Property. The dance is said to have been introduced from Shitenno-ji Temple in the province of Settsu (present Osaka City) in 1496. The dance consists of eight pieces including Miko-mai, Tsuru-mai, Shishi-mai, Ryu-mai and Toro-mai. Especially the Toro-mai (dance of mantis) is unique as a dancer wears an insect wig on his head. Along with the traditional dances of Amenomiya and Okuni Shrines, this traditional dance of Yamana Shrine is also designated as an Important Intangible Cultural Property. Moriyama Porcelain displays a variety of characteristics, such as pieces that have an earthy yet highly artistic sense which is called Aka-yaki. Some express folksy tastes with a Japanese flavor while others are contemporary. All of these porcelain works are born from the techniques inherited from the Meiji period (1868-1912) and the skilled craftspeople continue to develop their styles into the future. 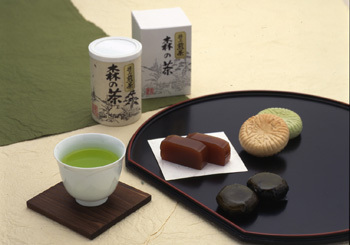 “Ume-goromo,” “Jiro-gaki Yokan,” “Ishimatu Monaka,” “Miso Manju,” and “Kuri Yokan” are the especially popular Wagashi Japanese confectionery in Mori. The city has many traditional Japanese confectionery shops which offer a variety of types and tastes. A delicious Japanese persimmon variety raised in Mori Town has a very fine texture with a rich sweetness and less seeds compared to other varieties making it easy to eat. About 170 years ago, a man named Jiro Matsumoto discovered a young persimmon tree by the Ota River and brought it back to his home to grow. 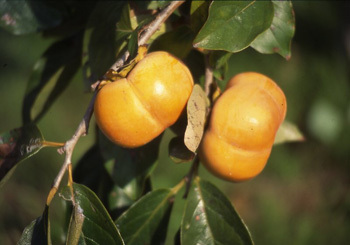 This is the origin of the Jiro Persimmon and the fruit has become one of the specialties of the town since then. One of Mori’s specialties is quality winter lettuce that is grown in a rice field with abundant sunshine and good quality organic substances. The “Mori’s cornfield” is cultivated later with a succeeding crop of lettuce. 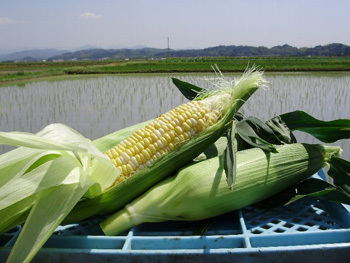 The fresh morning-harvest of sweet corn has a soft texture with a strong sweetness. Lettuce in Mori is cultivated under a vinyl tunnel and can boast to be the No. 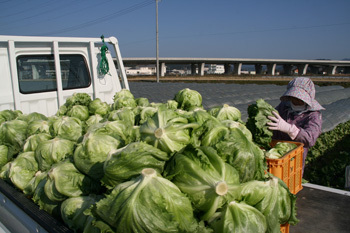 1 quality winter lettuce from over Japan. In December, many areas of the countryside south of Mori Town will be covered by vinyl tunnels for lettuce cultivation displaying a silvery scene. The opening of the song featuring the local hero Ishimatsu starts like this: “Enshu Morimachi is a great tea production town, and young girls go out to pick tea leaves…” This song was written by a local person from Mori Town, Fusataro Shima, and the music was composed by Torazo Hirosawa. The song “Enshu Morino-cha” soon became popular all over Japan after its release. Morino-cha tea is a local green tea which captures a perfect balance of bitterness and sweetness. The natural environmental advantages – pure spring water and mountain fog – are essential to produce this high quality “Mori Tea” with its rich natural aroma. 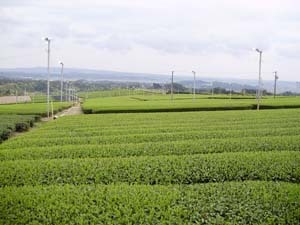 There are many traditional tea shops and local market in the town selling this top quality green tea.